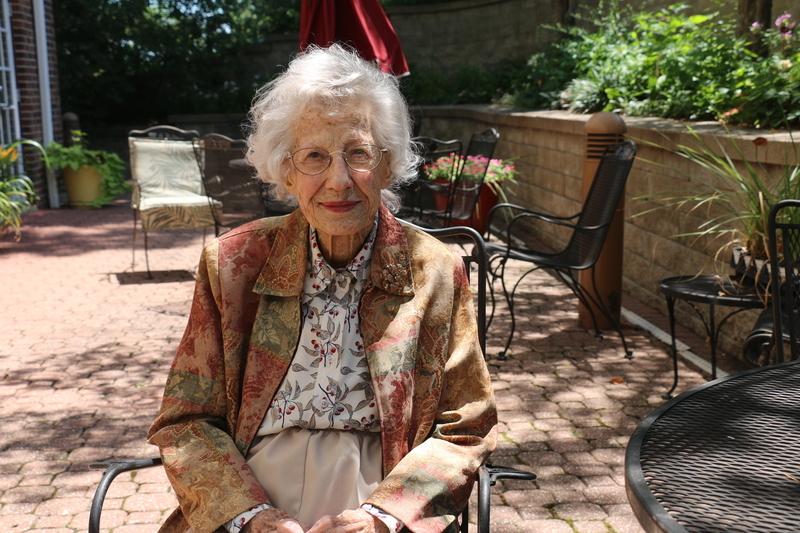 Bethesda Gardens resident Peg Sharp was born April 3, 1910 — less than seven years after the Wright brothers’ first flew at Kitty Hawk, and while the Titanic was still under construction. The first U.S. President Peg says she remembers was Woodrow Wilson. He served from 1913 to 1921. Had she been old enough to vote for him, however, she couldn’t have cast a ballot, because women were not granted the right to vote until 1920. Peg was the daughter of German immigrants, and was born in Brooklyn, N.Y., as Mildred Schroeder. She was not particularly fond of her first name, often shortened to Millie. In her kindergarten class, there were three Mildreds, who were dubbed Millie, Pilly, and Silly. She was called Pilly, and attributes the nickname to her struggles as a sister sandwiched between two brothers. Entertainment was not complex. “We had a lot of sidewalks, so all you had to have was a piece of chalk in your pocket to play hopscotch,” she says. The German families in the neighborhood often gathered for picnics on grounds next to a cemetery, where the children played while the adults drank beer. “I don’t think we kids paid much attention to the headstones,” Peg says. She remembers people arrived at the festivities via horse-drawn buggies. “We didn’t travel long distances in those days because you could only go as far as your horse could go,” she says. Peg’s family moved to a farm in New Jersey, and then into a small town where her father became a butcher in order to pay for his eldest son’s college tuition. Learning about other people and places was important to her parents. The only magazine her father allowed in the house was National Geographic. “He said it made for good dinner table conversation,” Peg recalls. When it was her turn for college, Peg went to Douglass College, a women’s college in New Brunswick, N.J. “It was the only college in the U.S. founded by women,” she says. “Every building on the campus was financed by a woman or a women’s club.” She graduated in 1931, with a major in German and a minor in French. She married John Sharp in 1936. He was a chemist who interviewed for a job with the Monsanto Corporation here, in St. Louis, MO. “It was the only job he ever applied for, and he got it,” says Peg. He went on to work for Monsanto for the next 42 years. Peg taught school in the Kirkwood and Rockwood school districts, and eventually became President of the Teachers Union. Peg and John had three sons before John was diagnosed with a serious illness that would eventually take his life. Peg had always been the adventurous type; a world explorer, if you will. Her husband, on the other hand, had been carefully preparing for their future. “He worked all his life to save money so we could travel, but he was getting weaker and weaker,” she recalls. But eventually, they did find the time to enjoy traveling together. One year, they bought an RV and drove to Alaska. On another trip, they found a company that strapped their RV to a railroad flatcar on a special train and delivered it over the road-less mountains of Mexico. There were many adventures in Peg’s life, including salmon fishing in Alaska and climbing in the Rocky Mountains. Her travels, many with John, included trips to Morocco, Yugoslavia, Germany, Russia, Egypt, India, and Australia. What she does still have is a keen, searching mind that is not obsessed with the past. She reads a newspaper every day and books on—what else—travel. Life is good for Peg at Bethesda Gardens, she says. She plays Wii bowling three times a week with her fellow residents, enjoys bingo, listens to music, and sees her surviving son John almost every day. They are now working on a video project together sorting through photos and slides. They read movie reviews and John takes her to the cinema. Her choices of movies and books (don’t hand her a silly murder mystery) is about learning. “I want something I can think about—something I can sink my teeth into,” Peg says. How does Peg deal with 108-years-worth of change? “It’s like a race. If you fall behind, you either speed up or quit,” she says. And Peg is no quitter. If you ask her if she has any regrets about her life, she will tell you that she wishes she had paid more attention; meaning she wishes that she had been better at distinguishing between facts and fiction, gaining knowledge and insight into what is real and important. “My father told me ‘If someone tells you something and you doubt it, don’t guess. Find out the truth.’ And that’s what I try to do.” she says. At 108, Peg Sharp is still exploring the world. Bethesda Gardens and all of Bethesda’s Independent Retirement Living communities in the greater St. Louis area offer a wide variety of activities for their senior residents. Schedule a tour at a community near you to see what this dynamic lifestyle can offer you in retirement.